I just have to send a plug for your wonderful feather duster. I know demand for them has been down–I wonder if new FlyBabies know how truly awesome they are. I CAN’T FLY WITHOUT MY FEATHERS!!! For a long time I couldn’t imagine that a feather duster would be helpful. My house was so dusty because I hated to dust, and I rarely dusted until it was so bad that the thick layers of dust had started to settle into a hard sediment that had to be scrubbed off. Finally I had it. No more scrubbing crusted-on dust, and yet I still hated to dust and pick up every little thing and get into every crack. It took so long and was so tedious! When I ordered the FlyLady Duster–WOW!–dusting became so fast and easy! Those luxurious feathers swirl around items on a table or shelf, picking up the dust and cleaning the surface and the individual items at the same time! So much time and effort saved! Plus I could reach higher without climbing on a chair and reach lower without bending my aching back so much. Plants are so easy to keep dust free with the gentle duster. All the uneven books on our many bookshelves are dusted with just a few swipes. My whole house could be dusted in no time! This “lifted me off the ground” and made the rest of the Weekly Home Blessing come much more easily, which lifted me higher still. At first I was tempted to put off my weekly feather dusting because the house didn’t look DUSTY anymore. But–AHA–I finally got it. If I FLY through the house with my feathers each week, my house will NEVER be DUSTY again! I have always loved the look of wooden blinds and shutters, but never dared to have them in my house because of my horrid memories of scrubbing them slat by slat as a child. With my feather duster, I dared to put them in my windows with a promise to myself that they would never get dusty. With my feathers, I’ve been able to keep my promise–just a few seconds a week with my feathers keeps my beautiful blinds dust free. For me, that’s FLYing high! Thank you, FlyLady for my wings. . . and my feather duster! 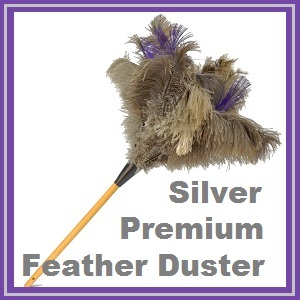 FlyLady here: We have a brand new Silver Feather Duster. It is really beautiful and does the same great job as our Premium Feather Duster. Be sure and add a calendar to your order. School will be starting soon! Feather dusting my whole house takes 2 minutes. I am using our Black Premium Feather Duster. In this video I am showing you how to dust; it took a little longer than 2 minutes! You never have to see dust again! This entry was posted in testimonials and tagged feather duster, flylady, get organized. Bookmark the permalink.